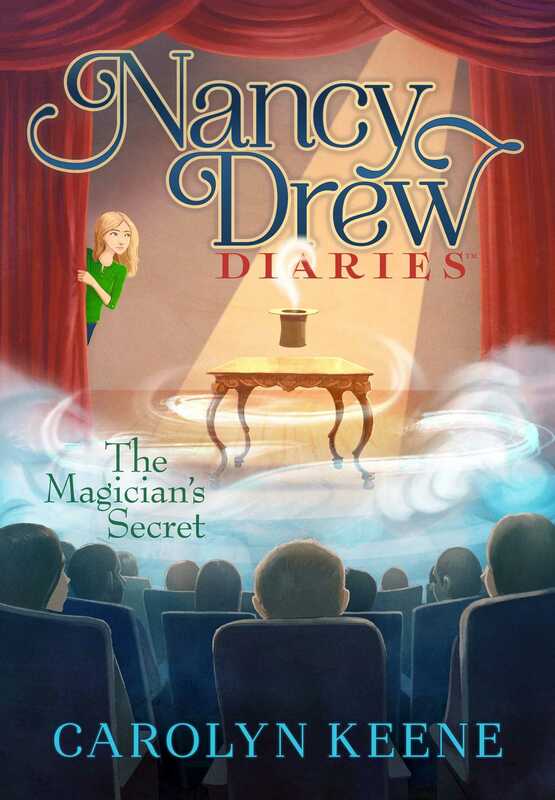 A major magic trick leads to missing murder evidence in this eighth book of the Nancy Drew Diaries, a fresh approach to a classic series. When she attends a performance by master illusionist Drake Lonestar, Nancy is skeptical. Lonestar is known for his razzle-dazzle wizardry, but can the magician really make the River Heights library disappear? As it turns out, he can—but that’s not the only thing that goes missing. Key evidence to an upcoming murder trial disappears in the midst of the trick. And one of the trial attorneys just happens to be Nancy’s father, Carson Drew, assisted by her boyfriend, Ned Nickerson. Nancy, Bess, and George are quick to jump on the case, but not quite quick enough: Lonestar has vanished, too, and not even his closest friends know his whereabouts. Magic is its own kind of mystery—but is this one Nancy can handle? My boyfriend, Ned Nickerson, just stood in the front hallway of my house and continued typing a text message into his phone. He raised his head. “Oh, sorry. I’m in the middle of an important conversation.” He took one more glance at the phone before lowering it to meet my eyes. “No way!” He looked up, startled, then touched his temples. “I’m sorry, Nancy. I promise I’ll find time for us to hang out,” he said. I knew what he meant. As busy as Ned was, my dad, attorney Carson Drew, was even busier. And his latest case was taking up all his time. My dad was defending a man accused of stealing millions of dollars’ worth of precious gems from a jewelry shop right in our hometown of River Heights. Dad was convinced that his client, John Smallwood, was innocent, but he couldn’t prove it. Not yet, anyway. Ned glanced down at his hand as his phone began to ring. “I really should—” He looked conflicted between answering what was obviously another important call and continuing the conversation with me. “The magic show,” I said, looping the purse, a new one my friend Bess had bought me, over my shoulder. Still no sign of recognition. “He’s probably the most famous magician ever to visit River Heights,” I explained. “He makes large . . . historic . . . monuments . . . disappear. . . .” I stretched out each word, trying to jog his memory. “I . . .” He paused. It was a pause full of possibility. “Maybe I could—,” he began again. Just when I thought I had convinced him, my dad’s office door opened. “I hope she hurries,” Dad replied. “That’s all perfectly normal. It’s a big case,” my dad put in. “The judge is keeping a personal eye on everything. Lawyers are only allowed to review the materials at certain times. When I went over there yesterday, Mr. Walton was there too.” He frowned. I knew my father had worked with prosecuting attorney Ted Walton before, and he didn’t trust him. Ned continued, “The police also collected materials from Mr. Smallwood’s hotel room. Along with clothes and papers, they found a locked box. No one could figure out how to open it without breaking in, and with so little time to review the materials, the box was put aside.” He sighed. “The police think the stolen gems are inside,” Ned said. “Did you ask Mr. Smallwood what’s in there?” A feeling bubbled inside me—that same feeling that always happens when a mystery presents itself. “He doesn’t know, but he insists that the box isn’t his,” Ned replied. I blushed but didn’t back down. I’d been solving mysteries my whole life. In fact, there was already a list forming in my head. CLUE: Unopened box. SUSPECT: John Smallwood. My nerve endings popped with excitement as I imagined the lists growing and then diminishing as I crossed off potential suspects and sorted through clues. “But if the jewels are inside and it can be proven that the box belongs to Mr. Smallwood, then the box might be the very thing to put your client in jail,” I reminded him. Ned gave me an apologetic look and, gripping his cell phone, took a step back. He said that as if I would be able to take one of my two best friends without taking the other. That would so never happen. Dad would have realized it himself if he hadn’t been so distracted. “Great,” he said. “Have fun. I can’t wait to hear all about it at dinner.” He gave me a quick hug, then scooted Ned into his office. I stood alone in the foyer. Somewhere in the bottom of my purse my cell phone buzzed. It was a text from Ned. I’LL TRY TO MEET YOU, it said. SAVE ME A SEAT. I smiled and quickly typed back, K. HOPE TO SEE YOU THERE. Then I phoned George and Bess in a three-way call. “You had front seat last time,” George argued. “I call it again,” Bess argued. “Whatever,” George replied with a groan. George Fayne and Bess Marvin were cousins, but no one would ever guess they came from the same genetic material. Where George would show up wearing whatever she found on the floor of her room, dark hair in a tangle, with a tote bag for a purse, Bess would get dressed to the nines, make sure her blond hair was perfectly styled, and change her bag to match whatever outfit she’d selected. Fifteen minutes to Bess meant we’d be waiting for thirty. “Uh-oh. Is this another case for Detective Drew? The Case of the Disappearing Courthouse?” George asked with a giggle. “Exactly.” I laughed and headed out the door.